Life is busy. You need a car that can keep up. You need a car that can perform, that gets good mileage, that keeps you safe, and that has all of the latest technologies. What’s more, you want to look good behind the wheel, catching eyes and turning heads wherever you go. The all-new 2018 Ford EcoSport gives you all of that and more. No matter which of the four trim levels you choose, you can be sure that you will get a great ride. With this compact SUV, you get all the space you need without the hassle of a full-size SUV. You can also customize the 2018 EcoSport to get exactly what you want, from the color of the paint to the type of engine and more. You can be confident that you’re getting a great vehicle when you purchase the 2018 EcoSport. 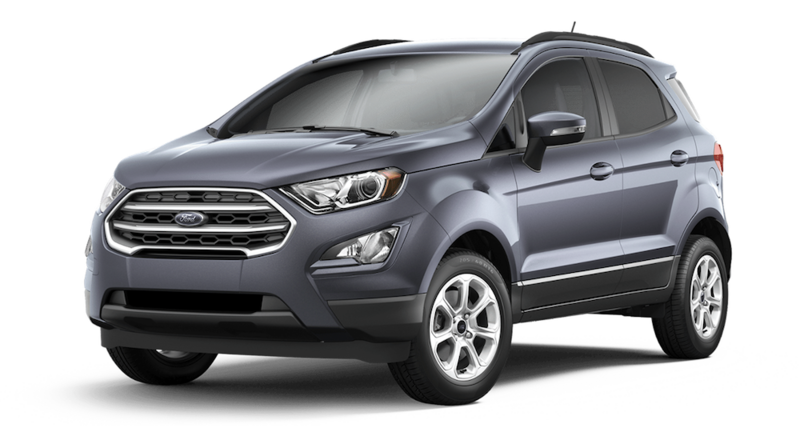 After, consider how much other drivers love their EcoSports; the 2018 Ford EcoSport received a 9.5 out 10 consumer rating on Kelley Blue Book. We look forward to showing you exactly why you’ll love the 2018 Ford EcoSport too. The 2018 Ford EcoSport gives you all of the power, performance, and storage that a busy, on the go family could possibly need. There are two engines to choose from with the 2018 EcoSport. The standard engine on the S, SE, and Titanium trims is the 1.0-liter EcoBoostⓇwith auto start/stop technology. This engine is turbocharged and direct-injection, packing it full of power. The 1.0-liter engine delivers 123 horsepower and 125 lb.-ft. of torque, allowing you to cruise the roads with ease. The standard engine on the SES trims and optional on the S, SE, and Titanium trims is the 2.0-liter Ti-VCT I-4 with auto start/stop technology. This engine is paired with Intelligent 4WD to give you peace of mind no matter what the road conditions are. The engine also gets you 166 horsepower and 149 lb.-ft. of torque. Each engine is paired with a six-speed SelectShiftⓇautomatic transmission to ensure that your ride is always smooth. Likewise, AdvanceTracⓇwith Roll Stability Control™ keeps your ride smooth no matter what the weather. In rain, snow, or ice, the system will give you increased stopping power, improved traction, increased response time, and additional stability. The system will check the vehicle’s stability 150 times per second and can correct the vehicle’s path by applying the brakes to one or more wheels. It can also sense if the rear wheel will slide out and apply the brakes accordingly. As if that’s not enough, the system increases the brake and throttle control to prevent rollover. It monitors the vehicle’s body angle and speed, reducing power and braking one or more wheels to help correct the incident. As a compact SUV, the 2018 EcoSport seats five comfortably, making it perfect for small families or anyone who has to haul a lot of materials on a daily basis. The EcoSport also delivers good gas mileage, saving you money at the pump. All trim levels except for the SES get 27/29 MPG; the SES gets 23/29. No matter which trim you choose, you can count on saving money at the gas station. Store just about anything with the impressive amount of space the 2018 EcoSport offers. Behind the second row of seats, you’ll get 20.9 cubic feet of storage. If you need more space, not to worry; there is a max of 50 cubic feet of storage space behind the first row of seats. Simply fold down the second row and you’re good to go. When you’re on the go, you need to stay connected. The EcoSport gives you all of the technologies you need right at your fingertips. The available eight-inch full-color touchscreen display essentially works exactly like your smartphone or tablet; you can swipe, pinch, and even zoom. The EcoSport also provides the convenience of Intelligent Access with push-button start. Leave the key fob in your pocket or bag, and the doors and swing gate will unlock without you ever touching the fob. You can also even start your car without ever taking out the key fob. Talk about convenience. Ford’s available SYNC® 3 infotainment system offers both with Apple CarPlay® and Android Auto™ compatibility and even uses specially enhanced voice recognition technology. Keep all of your devices charged and ready to go with the two built-in USB ports and the 110V outlet in the rear. Enjoy all of your music and podcasts to their fullest with the 10 speaker B&O PLAY premium audio system that was designed specially for the Ford EcoSport. Stay connected all day long with the SYNC® Connect Wi-Fi hotspot. Powered by AT&T, the EcoSport’s Wi-Fi hotspot can support up to 10 devices at once and can be used up to 50 feet outside of the car. With features like these, the 2018 EcoSport will feel like your second home. The 2018 Ford EcoSport aims to make you feel good by looking good. After all, you can’t help but be happy when you’re traveling in style. The 2018 EcoSport comes in four different trims, the S, SE, SES, and Titanium. Each has their own subtle take on the aesthetic of the EcoSport design, but all have an undeniable sense of style. Choose from 10 signature colors, ranging from soft and subtle neutrals to bright pops of color. If you choose the SES trim level, you’ll be rewarded with all kinds of luxurious exterior and interior details. Enjoy the fine crafting of the partial leather seats and marvel at the bright copper accents and black exterior details. You’ll also get a variety of other premium features like a moonroof, heated front seats, paddle shifters, a six-way power-adjustable driver’s seat, and a leather-wrapped steering wheel and shift knob. Standard on the SES trim are roof-rack side rails with crossbars and 17-inch premium Dark metallic wheels to provide functional yet dramatic styling. On the EcoSport SE, SES and Titanium trim levels, LED signature lighting and halogen projector headlamps come standard. These lighting choices not only help you see better, but they announce your presence the moment they’re turned on. Along with these signature lights is the fun and unique rear swing gate with a hideaway latch that gives the EcoSport its own special flair. Located in Albany, New York, DePaula Ford is ready to provide you with the best car-buying experience possible. From our wide selection of 2018 EcoSports and other Ford vehicles to our knowledgeable and friendly staff, DePaula Ford is here for you. Whether you’re looking for a brand new 2018 Ford EcoSport or want to browse our inventory of new and pre-owned vehicles, you can count on us to help you find exactly what you’re looking for. And with special offers, in-house financing, and a fully equipped service center, you’ll find everything you need at DePaula Ford to make your buying and driving experience easier. You can trust us to put your needs first in everything that we do, from our up-front pricing and stellar customer service to our around-the-clock availability. 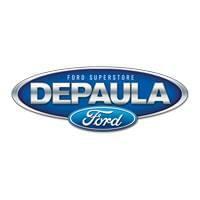 Visit us at DePaula Ford today and let us help you find what you’re looking for.